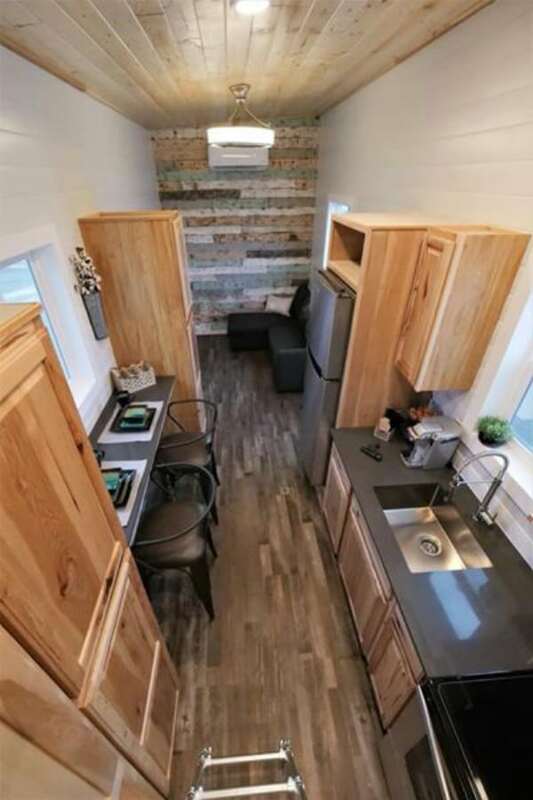 What draws people to the tiny house lifestyle? For a lot of folks, that answer is “freedom.” We dream about being free to travel where we want, to live with less weighing us down, to express our personalities in a tiny space that is all our own. 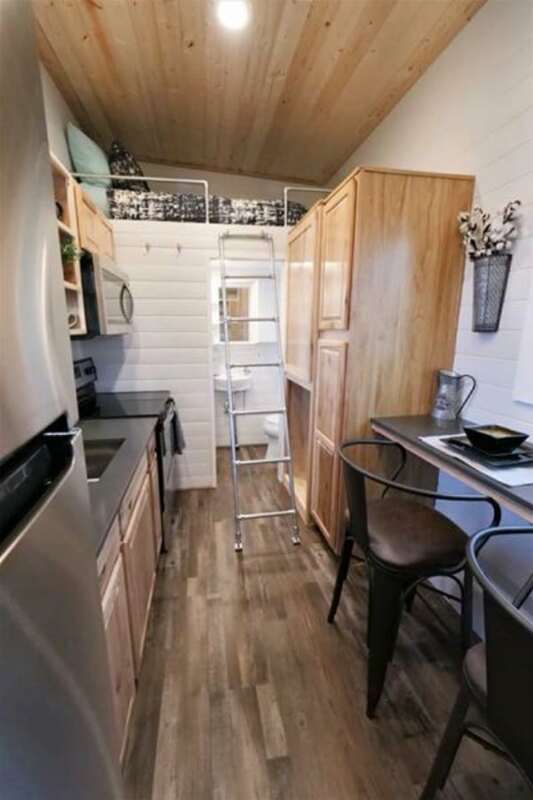 One company that is encapsulating that dream in lovely tiny abodes is the aptly-named Free2Roam Tiny Homes. This model is currently on sale for $65,000. 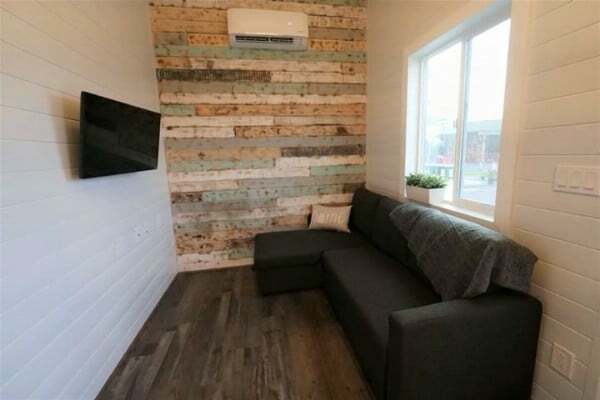 It measures 240 square feet, and includes one bathroom and two sleeping areas. The walls feature foam sprayed insulation for warmth, and a metal roof holds up to the elements. One of the most attractive parts of the home is definitely the kitchen. With its hickory cabinets and quartz countertops, it has a sleek contemporary look. The low profile of the metal ladder leading up to the loft fits in perfectly. You can see the microwave, oven and cooktop in this photo, as well as cool open corner shelves integrated into the cabinetry. The kitchen also has room for a full-size refrigerator and freezer as well as a bar beneath the window. 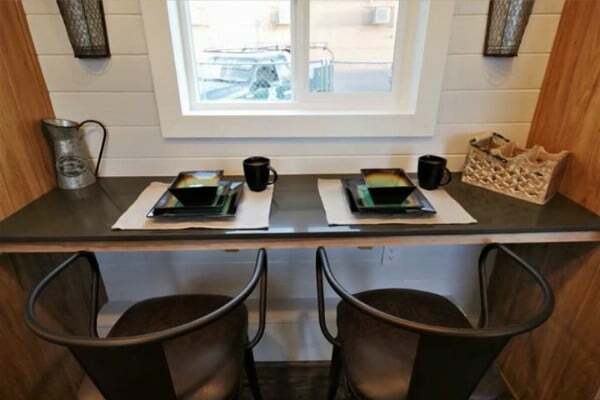 The chairs feature the same contemporary vibes as the rest of the kitchen. A door through the back leads to the bathroom underneath the loft. Those chairs are really cool! I’m a fan of the dishware as well; too bad it probably doesn’t come with the house. 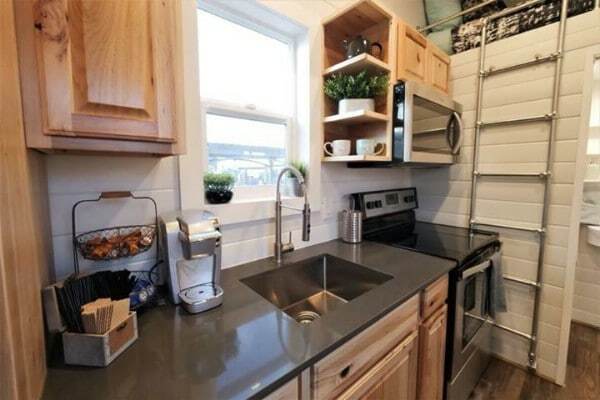 This photo gives you a closer look at the sink as well as the bathroom. Speaking of the bathroom, here is the flush toilet and the vanity. 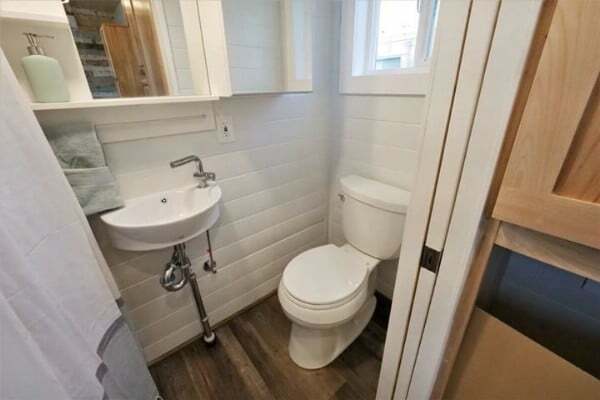 While the bathroom is very small, the layout keeps it from being cramped. The back wall in the living room is like a work of art. The different wood colors make for elegant décor, built right into the house itself. Since most of the wall across from the couch is open space, one could feasibly raise or lower the TV as desired. You can see in this photo how it all fits together. Notice how the cabinets form a semi-partition between the living room and the kitchen, naturally separating the space based on function. With its neutral colors, this house is a great fit for any personality. You could easily add in whatever colors you like through your own decorative accents and have everything work together beautifully. If you would like to learn more about this lovely house, you can check out Dawnene’s post in the Tiny House Marketplace on Facebook. 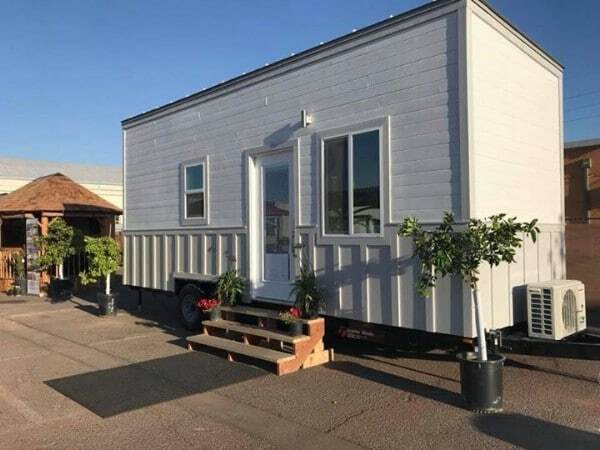 You can also visit the official website for Free2Roam Tiny Homes. 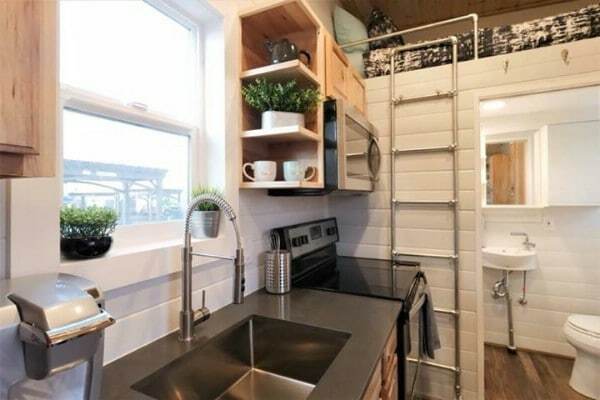 I am certainly interested to purchase a tiny house without a sleeping loft. 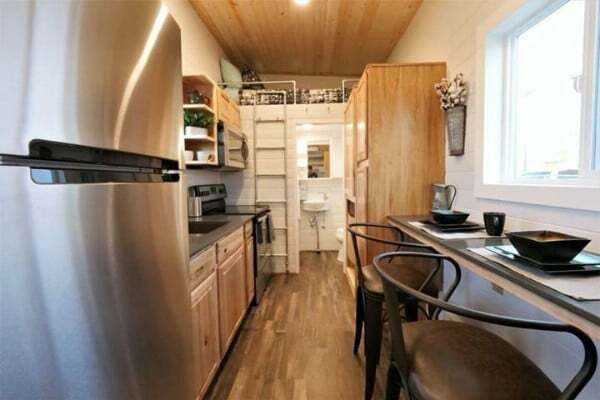 Of course, most tiny house viewed have sleeping loft. I am drawn more for a small section loft just for storage. My interest are to those seller who are located on the eastern part of the USA.